This week's edition of On The Numbers digs into regular-season overtime finishes, Eli Manning's personal broken milestone, rookie running backs, increase in PATs made and more. Welcome to Week 5 of On the Numbers, a weekly column which mines for statistical oddities, numerical fun facts and analytics observations from around the NFL. In a week that saw Josh McCown lead all quarterbacks with 457 yards passing—and Johnny Hekker lead all punters with 20 yards passing—there was plenty of action to break down. Week 5’s winner for most abrupt ending came from Atlanta, where Robert Alford picked off Kirk Cousins in overtime and ran it back 59 yards for the game-winning pick-six. If you’re thinking that’s not something you see every day—or every year—you’re right. According to Pro Football Reference’s touchdown finder, it’s the first overtime pick-six since Josh Wilson picked off Matt Schaub in 2010 and ran it 12 yards to the end zone for a Ravens victory over the Texans. Alford’s return is the longest overtime pick-six since the Cardinals’ Lorenzo Lynch intercepted the Seahawks’ John Friesz and returned it 72 yards for the winning score in October 1995. It may have taken 20 years for an overtime pick-six to be taken that far back to the house, but overtime does end in a pick-six more often than some other scenarios—including both kickoff and punt returns. So when we get that first overtime missed field goal return for a touchdown (Auburn fans call this the kick-six) then we’ll have really seen everything. ​Leaderboard movers typically celebrates players for making their way up the all-time leaderboard in various statistics, but this week I’m making an exception. Eli Manning threw three touchdown passes Sunday night, including the game-winner on a fingertip grab by Larry Donnell in the final minute. Manning now has 10 touchdown passes on the season, and 269 on his career. 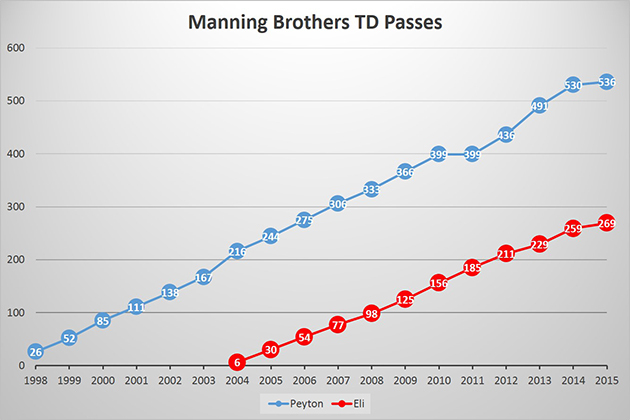 He didn’t pass anybody on the all-time passing touchdown list, but he did notch a personal milestone: In the middle of his 12th NFL season, Eli finally has half as many career touchdown passes as his big brother Peyton. Eli has almost no shot to catch his big brother, but at least he’s no longer getting doubled up. And since Peyton threw zero touchdown passes on Sunday, and has just six this season, Eli also has a chance to throw more in a season for the first time ever that they’ve both been healthy. The league’s high rusher for Week 5 was the Seahawks’ Thomas Rawls, whose name you may not have heard until a couple weeks ago. The running back, who spent three mostly unproductive years at Michigan before topping 1,100 yards his senior year at Central Michigan, went undrafted in 2015. ​But filling in for Marshawn Lynch again this week, Rawls ran for 169 yards. He’s the first rookie to rush for that many yards since Alfred Morris in Week 17 of 2012. He’s also the first undrafted rookie to run for at least 169 since the Packers’ Samkon Gado ran for 171 yards in Week 14 of 2005. The only other undrafted rookie to reach Rawls’s 169 since the 2000 draft is Dominic Rhodes, who had a 177-yard game for the Colts in 2001. Seventeen running backs have combined for 23 such games in that time frame, with many of them drafted in the first round (Doug Martin, Adrian Peterson, Joseph Addai, Kevin Jones, William Green, Jamal Lewis) or the second (Julius Jones, Clinton Portis, Anthony Thomas). So Rawls’s day wasn’t quite enough to help the Seahawks close out the Bengals, but it was enough to take this week’s Feats of Strength honors. An ongoing quest to chronicle the way the new extra point rule affects game theory in 2015. Apologies to those of you who tuned into Week 5 hoping to see another barrage of missed extra points. 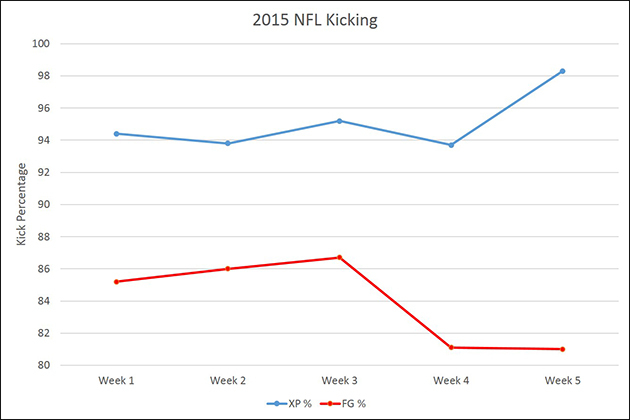 After four straight weeks with at least four PATs missed around the league, kickers went 57-for-58 in Week 5. Caleb Sturgis sent one wide left for the Eagles, the only blemish against an otherwise perfect week of PATs. What’s the reason for this sudden lack of misses? The one obvious answer is that fewer were attempted, partially thanks to more teams having bye weeks. Beyond that, there are several possible reasons, but all are easy to poke holes in. So the answer likely comes down to good old-fashioned small sample size flukiness. This should have been expected. I wrote last week that even though some people were already drawing connections between the longer extra points and the declining field goal rate that I thought it was better to wait for a larger data set. So this suddenly strong week in the extra point department is a good reminder to be careful not to draw too many conclusions from any of the kicking data this early in the season. Just sit back, watch and try to enjoy the chaos. Several games this week were made more exciting thanks to the spread. The Bengals spent the majority of the week at -3 against the Seahawks, closing on that number at the Westgate SuperBook and elsewhere. So their dramatic comeback and three-point win made for an exciting push. But clearly that finish was exciting because it featured two good teams and the actual outcome of the game was in doubt. This week’s Great Moments in Vegas turns to Lambeau Field, where the Rams closed at +9 against the Packers. After a Packers field goal extended the lead to the 24–10 with 1:03 left in the fourth quarter, an optimistic Rams fan might have said the team was driving down for a miracle comeback. More likely, it was just the backdoor cover in play. Even one touchdown drive in that amount time felt like a tall order—until Stedman Bailey got open behind Quinten Rollins and Nick Foles hit him in stride for what looked like a 75-yard touchdown. But Ha Ha Clinton-Dix chased him down and tripped him up at the seven yard line. Rollins redeemed himself on third-and-goal with his second interception of the day, which sealed a Packers win and a cover for everybody who had Green Bay +9.